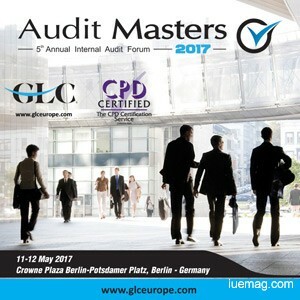 Following the great success of the 4th Annual Internal Audit Forum, the team is happy to invite you to its 5th Annual Internal Audit Forum, which will be held on 11th - 12th of May 2017 in Crowne Plaza Berlin-Potsdamer Platz in Berlin - Germany. Through the networking and question and answer sessions you can connect with industry leaders and build up your network all around Europe. - Best Practices: Real-time disclosure of processes that winners developed and leaders follow. - Meet & Greet: Alliance with leaders, connect with distant peers, share & influence. - Build a Network: Connect with similar-minded peers and build a community to share tomorrow’s challenges and solutions. - Industry-driven content: Get access to the right content from the right set of people. - The finest Speakers: Senior and higher management presenters from top-notch industry establishments proven to make a difference. The iUeMagazine team is delighted to work with the 5th Annual Internal Audit Forum as Online Media Partners & is expected to bring Unlimited Inspiration for all readers from the proceedings of this event. Staying tuned to the enriching updates from this event is recommended.